This has become a long blog again. I introduce a solution for all humanitarian problems in the world and all related crisis. It requires a lot of explanation because it involves all current institutional powers in a new setting. And finally comes back to the power of our individual selves. Soon I will publish a booklet on the issue but my sense of urgency is so big that I cannot wait to reach out to those of you who can become already changers of the world after reading this. For humankind it could be the most important blog ever as long as I can reach out to you soul and make you aware. Please take some time to absorb the information and place your own self in perspective. See what happens when you suddenly realize that humankind could get to depend on your own next steps. It is fun AND a huge responsibility. Can you handle it? That is up to you. I am ready to help you when you are. Over the years we have grown dependent on institutional activities because of the impact they have on our lives. The unique capacity of an institution is that it can enlarge a single activity into huge proportions. A single human being cannot do that. We have grown to depend on the institutions because they provide us luxury articles, financial means, governance, jobs with related salaries, scientific knowledge, etc. Most current institutional structures of today were born already some 150 to 100 years. The conditions in the human world were right back then to allow such fragmented focus to occur with the related growth of institutionalized power. Still now the discussions in this world only talk about growth and more growth as a single sign of strength. Due to this fragmented focus these organizations can only take responsibility for their own small field of highly specialized attention. They started to relate via this specialization to compliment each other in their objectives. A manufacturing company in the 19th century would have its own transportation system, energy supply, uniform making unit for their personnel, etc. But gradually in the 20th century the further specialization allowed institutions to focus on their core business and select suppliers to outsource their surrounding needs. In the middle of the 20th century the patchwork of specialized institutions because so large and so competitive in their mutual interaction that a chain of dependencies appeared and with it new techniques of managing the chain. Due to the focus on fragmented institutionalized interests the awareness for “the whole” disappeared entirely. Things like pollution, usage of natural resources or humanitarian issues became subject to competitive policies. Institutional survival became more important than the consequences of such survival decisions. Non of these consequences could be challenged by any single authority. What authority should do that? A local government has no global authority to regulate. Yet they do have a dependence for economic growth, imports and exports as well as labor and tax perspectives. Global authorities on the other hand have no formal jurisdiction in the countries or in the institutionalized business enterprises and banking policies. They may have a bureaucratic influence on awareness (like VN resolutions) and certain fragmented authority on addressing common institutionalized interests (like military actions in Afghanistan or embargos on certain countries). As fragmentation of power grows further, the chain of interdependence becomes more complex. Despite the competitive fragmentation and specialization each individually could grow due to globalization of markets. The competitive shakes outs would start the intense optimization processes in each of the institutions to remain competitive and attractive in the chain. As time went by we see each of them weaken in quality and strengthen in financial speculation. CEO’s and Country presidents became bankers and debt managers rather than protectors of value driven identities. The overall shortage of resources started to demand its toll on the global organization of giants that could not feed themselves anymore on natural value creation. The liberalization of money from a valuable collateral (s.a. gold) allowed speculation to flourish as only remaining resource to sustain institutional fragmentation and growth. Access to the available resources became available to the highest bidder. Countries who wanted their populations to survive while active with some labor and high debt programs had to grow their debt themselves. The growth of institutions is still the blind common culture of executives and politicians but growth is already for a long time not possible anymore. Not as a natural process of value creation anyway. The only financial growth that can be achieved is through speculation around shortages but this is controlled only by the powerful and has nothing to do with the general public anymore. They are just manipulated to accept a debt they did not ask for and that solves nothing. Humanity is in the hands now of institutionalized, destructive, fragmentary focused financial robots that have no morality nor sense of responsibility except their own self interests, creating crisis after crisis, chaos upon chaos. Now we go back to the beginning of this blog. The true power of an institution is its possibility to enlarge any fragmented specialization to huge proportions. Their handicap is that they cannot take responsibility other than for their own piece of specialized power. That goes for regional governments, business enterprises, educational institutions, etc, etc. None can take responsibility for true human values yet they all have interest in it because they are part of the institutional survival. Without consuming, demanding, debt creating, voting or working public the institutions will eventually die. So in one way or another any institution has the intrinsic need to connect again to integral human values but cannot do that for the whole, just for a small part of it, competing for it. So when we talk about the taking of responsibility for human sustainable progress no one can or will stand up to take responsibility other than maybe some local politicians. They tend to promise responsibility that they cannot handle because it s beyond their control. They try to solve it in four year periods which many do not complete, by raising taxes and public debt with solving anything. Only one can take responsibility and that is the pioneer. It seems funny that with all those incredibly big and seemingly powerful institutions the sole responsibility of human progress could lie in the hands of a bunch of pioneers. But it is true and makes perfect sense. The robotic institutions can be our enemy when we see their unconscious destructive force while preserving their self interest in their fragmented world of material power, but they can become our friends when we can get to use their institutional powers of expansion in a proper way. Thanks to the de-institutionalizing powers of a crisis, in which the organizations need to go into survival mode, decreasing in size due to the lack of resources to draw from, they become also often sensitive for new ventures and responsibilities in which their field of expertise can excel. This is an opportunity for the pioneer but also for the institutions. How does it work? The pioneer takes responsibility for a complex humanitarian progressive proposition. He or she subsequently invites all necessary institutional powers to help enlarge it. 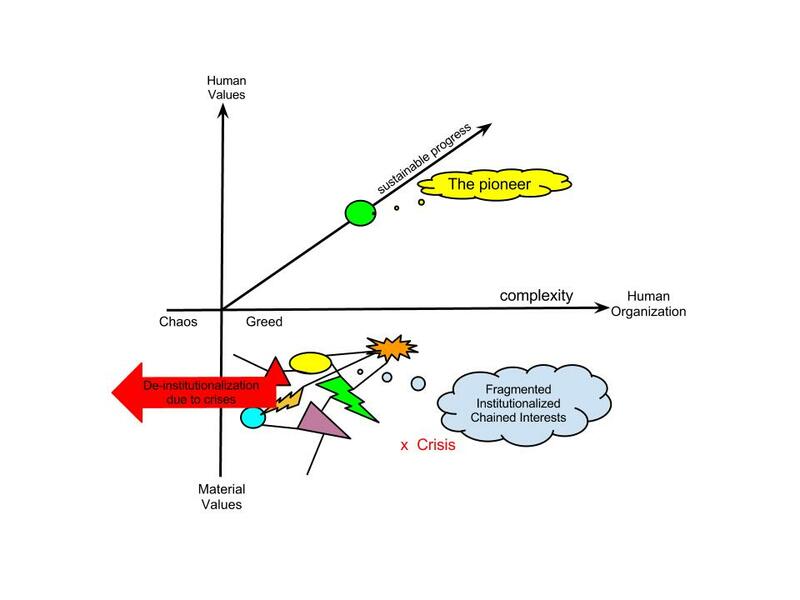 The role of the pioneer is to define complex progression based on human values. When inviting the institutional powers to join the pioneer they are asked to enhance the responsibility with their own institutional powers. To make a holistic proposition of human values one cannot just rely on a single empowering institution. If that were the case the institution would have done this already by itself. The complexity of the whole is that it needs the entire mix of authorities of a society to become effective, with the pioneer sitting bang in the middle. Drawing all these authorities from the field of fragmented interests, they unite in the field of common responsibilities together with the pioneer. Seemingly contradicting interests suddenly start complementing each other as the focus lies on progressive goals outside the scope of self interest. The self interest can be complied with only if the common interest is achieved. This forces the authorities to enter into co-creative processes by trying to understand each other and join forces. The pivot is the pioneer who safeguards the humanitarian interests in a battle field of institutional giants. In the Netherlands I have started experimenting with this pioneership. It resulted into a series of initiatives that are proving their value from a humanitarian perspective but also the institutional positioning into a new world. Each of the authorities has a chance to excel in its own field of competence, not by competing or creating interdependence but by combining the individual competences into a common goal. Since executives and personnel in such institutions are human beings too we find that the sensitivity of the hard material robotics become more soft to address human wealth issues through new types of policy makings. The institutions change slowly into supportive and facilitating identities that gather new public admiration. They truly become extenders of human progress to which they attached their fragmented by highly specialized competences with new perspectives of survival first but institutional sustainability in the long term. The field of chaos can now be managed with the perspective of an institutional alternative, not just to create value but to contribute to a greater cause, enhancing it and expanding it. To extend these finding globally I have started a training school for sustainocracy, training pioneers as well as institutional executives on their new age responsibilities and challenges when entering the field of sustainable progress and all related differences with the old paradigm. Pass the word and help change the world. By Jean-Paul Close in 5K world, multidimensional world, Society on May 26, 2012 .